British Vogue has launched a new initiative meant to educate schoolchildren about the perils of comparing oneself to the images in fashion magazines. According to the magazine's Editor-in-Chief Alexandra Shulman, "The problem, if there is a problem, comes when people judge themselves and their appearance against the models they see on the pages of a magazine and then feel that in some way they fall short." Her solution? An educational film, entitled It's a Look, meant to highlight how carefully constructed — and not real — fashion images are. It's a Look comes with an accompanying lesson plan, and it's targeted at high school girls aged 15-16. Says Shulman, "I decided it might be helpful to show what goes into the creation of a Vogue fashion picture, as a way of illustrating the skill and artifice that makes the final product." This endeavor is a result of the magazine's recent Health Initiative, a pact between the 19 international editors of Vogue to encourage a healthier approach to body image. As editor of Vogue, I am frequently asked about the influence and messages the images in the magazine send to our readers about body image. Our mission in Vogue's fashion pictures is to inspire and entertain, while showing the clothes created by many highly talented designers. They are created with this intention in mind, not to represent reality. To me, it seems fairly impossible to promote healthy body image while continuing to circulate images of an unachievable beauty standard. Claiming that fashion images are meant to be taken as mere entertainment fails to take into account the ubiquity of impossible beauty ideals (and the way those ideals affect women's conceptions of their own bodies). As Farhana Nazir asks at My Fashion Life, "Yes, magazines can be viewed as escapist outlets, but when they’re dictating what we should be buying, where we should be dining and whom we should be wearing, is it possible to dismiss the imagery — one of the strongest elements of a magazine such as Vogue?" Bloggers and activists have expressed outrage over designer runways and glossy magazine editorials that have remained stubbornly, homogeneously white... Parents, consumers and health experts have lamented the risks of using preternaturally thin, adolescent girls to model clothes created for mature women and presented in adult environments. And activists have pushed, prodded and attempted to shame the industry into being more accountable for the continued existence of sweatshops that mass-produce garments at cut-rate prices in struggling communities around the globe. 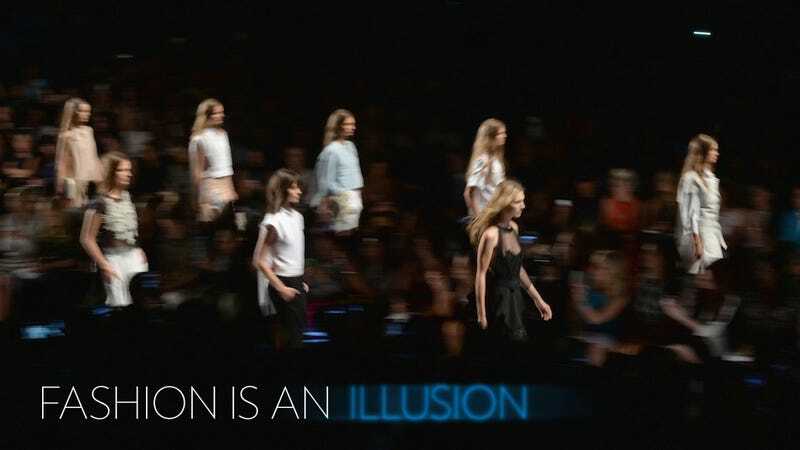 As it stands right now, fashion is an illusion. It does not map onto real life. As the British Vogue film strives to show, it promotes an impossible ideal of beauty and body size. And, as the WaPo article argues, it's an illusion in other ways as well: the industry continues to be hideously whitewashed even as America grows more diverse and countless mass retailers are propped up by unlawful and completely unethical labor practices. Acknowledging that "fashion imagery does not equal reality" is a good first step, but the real solution lies in making the world of fashion more accurately represent the real world — not in insinuating that it has no responsibility to. Eyes are on an industry that season after season watches design houses consistently use one or no models of color. No matter the intention, the result is racism. Not accepting another based on the color of their skin is clearly beyond ‘aesthetic’ when it is consistent with the designer’s brand. Whether it’s the decision of the designer, stylist or casting director, that decision to use basically all white models, reveals a trait that is unbecoming to modern society. It can no longer be accepted, nor confused by the use of the Asian model. Kolb and Diane von Furstenberg from the CDFA are reportedly open to speaking with Hardison in order to discuss further steps to foster more runway diversity. Here's hoping that naive detachment from pressing social issues — racism, unsafe work conditions in sweatshops that pay workers far under a living wage, the normalization of unhealthy body ideals — will go out of style.